Click the image to see the 360 interactive panorama created by Craig Strong, of the Lensbaby fame, at our workshop! Click-n-drag to look around. Right-click and drag to zoom. I used the Lunagrip with a speedlight to illuminate the model in various positions. He shot the image with the Lensbaby fisheye and stitched it all together using PTGUI. I’ve been using the Yonguo transceivers for some time with my Nikon cameras and speedlights. I wanted to see if a fairly cheap unit could keep up with the more expensive offerings. As a teacher, I get asked for gear recommendations all the time, and many of my students simply can’t afford top-of-the-line gear, so it helps to have alternatives that leave them some latte money at the end of the month. Cause, you know, stuff like that is really important too. I love my PocketWizard transceivers, and have been a big fan for many years. While they are worth the investment, some just can’t justify the price yet, and the Yongnuo system is the next best thing I’ve tried. It’s even better than sliced bread. In my lighting workshops, I recommend a simple, versatile lighting kit that will light up your life with the best of the more expensive alternatives. This kit covers all of the essential lighting styles: Large Window, Medium Diffused, and Crisp & Direct. With these simple tools, we can emulate almost any quality lighting setup you see in professional portraiture. The complete kit contents are listed at the end of this article, but the primary tools are a large scrim (like the Scrim Jim from Westcott), the Westcott LunaGrip (that I designed for Westcott), and a RogueGrid. Each of these works beautifully with your speedlight, making portability a huge advantage and saving you money on chiropractor visits. The invisible glue that ties them all together are the wireless transceivers that tell the flash when to fire and at what power level. There are myriad brands of wireless transceivers out there. Some are so crazy cheap as to be nearly disposable. Most of the cheap-o units are basic signal senders – no TTL or fancy power adjusting capabilities. The transmitter says “fire” and the receiving unit does – most of the time. They may not even work at your camera’s top sync speed (normally 1/200 or 1/250) but if you keep it under 1/200 and chant the magic words of love and encouragement, they may decide to fire. On the other end of the spectrum, there are more expensive units that speak the language of your particular camera and can wirelessly control your flash with full TTL (Through-The-Lens) metering and exposure. You can quickly adjust the power of multiple connected flash units from right under your nose, on the camera, and never have to leave the comfort of your bean bag chair to adjust your flash exposure. The Yongnuo system seems to sit nicely in the lower cost spectrum, yet offers the full feature set of more expensive offerings. You can manually pop just about any flash unit, even studio strobes, with the appropriate cable adapter. You can adjust the output of a remote speedlight, either manually or exactly as you would a TTL flash sticking off the top of your camera. You can remotely change the zoom of the speedlight, which is really handy when you use a tool like the LunaGrip and like to change the zoom setting for different lighting effects. And, you can use the High-Speed Sync features of your speedlight seamlessly. There are many other advanced features, but these are the bread-and-butter (ahck! There I go with the bread thing again) features that most photographers use regularly. In my recent GROW Photo Workshop, B&H provided extra Yongnuo controller/transceiver systems for my students to use during our lighting exercises. I wanted to see how intuitive to use they were for the photographers who were new to flash systems. I gave them a brief demo and they all seemed very comfortable taking it from there, adjusting away with very little confusion. We connected both Nikon and Canon flash systems at the same time and were able to fire each system individually and simultaneously without any channel cross-talk or misfires. In fact, through our full day of use – from outside in the forest to inside our studio, they fired consistently without any hiccups. In the past, I have had occasional misfires from these (and other more expensive units) when used around heavy concrete or metal structures with other radio interference going on. Changing channels or adjusting your position slightly usually solves the problem. If you do find yourself in an radio signal black hole, and can’t seem to get your triggers to fire consistently, try switching to simple manual trigger mode. Using the remote power adjustment and TTL features requires a more complex and delicate radio signal – subject to disturbance more than straight-up manual triggers. The Yongnuo system that I recommend consists of 2 different units. The YN622N-TX (YN622C-TX for Canon) is the Transmitter Controller unit. This goes on the camera and is the mastermind behind your flash system. You have an LCD screen that allows you to control everything you need on your far-away speedlight – provided the flash is connected to one of the YN-622N II (YN-622C II for Canon) transceivers. Technically, you can use 2 of the YN622N II units – one on camera, one on flash, since they are TRANSceivers, not just REceivers. However, it is much harder to adjust the settings of your remote flash this way. Use the YN622N-TX controller on camera and life will be good. The nikon starter kit 2-pack consists of the on-camera controller and a transceiver for the flash. Click to view it on B&H. With a controller on camera, you can connect numerous speedlights to 622N II transceivers and adjust them all independently. The system has 7 channels with 3 groups per channel to minimize interference with other photographers on the same system. So, you can independently control 3 flash units at once. You can actually put more than 3 flashes on receivers and set them to the same group, but they will receive identical adjustments, e.g. if you adjust group B to 1/2 power, all the flashes on group B go to 1/2 power. If you want to connect more than 3 flashes, and adjust the power of each uniquely, then put your main and secondary lights on group A and B, for unique control. Then connect all the other flashes to group C with basic triggering and manual power adjustment can be done at the flash unit. You can even use a PC cable Y-splitter and connect two speedlights to one transceiver – albeit with manual triggering only. If you happen to have a non-Nikon/Canon camera, you can still use the triggers in basic trigger mode (no TTL or remote power adjusting your flash) if your camera uses a standard hot shoe connection. In this case, only the center contact is used for basic “fire” signals. Downsides? Well, other than rare interference misfires, which, to be fair, are the bane of ALL wireless radio systems, the only real downside is the broken English instruction manual. It was obviously translated by a non-native English speaker. The translation is not horrible, and you get the general idea most of the time, but some of the more powerful and complex features are harder to figure out without clear instruction. Fortunately, the basic usage is, well, pretty basic, and you will be up and running in no time. To get started, you’d want a YN622-TX (either Canon or Nikon specific) for your camera, and a YN622 II transceiver (Nikon or Canon specific) for each remote flash you want to independently control. B&H has a Nikon starter pack, with (1) YN622N-TX and (1) YN622N for $77.99. You can also get a 2-pack of additional transceivers for about $77. For Canon, get the controller solo for $42.90 and a 2-pack of transceivers for $77.99. Don’t ask why they don’t have the same kits across the board. The yongnuo transceiver holds a BOLT flash unit on the Westcott Lunagrip flash diffuser. For most of my lighting techniques, in studio or on location, I use my Westcott LunaGrip. This is a product I designed and patented. It grew from 20+ years as a wedding photographer. It creates amazing light, similar to a 40" softbox, but is light, compact, and much more versatile and affordable. The included bracket adjusts for most speedlight and receiver combos. If you are looking to save some additional dough (ugh, more bread analogies! ), consider the Bolt speedlight from B&H. It is a full-featured, TTL and wireless compatible flash unit with specific models for Canon or Nikon. This light is not quite as stout, or feature rich as the comparable models from the camera manufacturer, but they work perfectly. They are great if you just need the essential features and prefer to divert a bunch of, uh, green, to more important things – like yard gnomes. So, here’s the bottom line. I love my high end gear and you generally get what you pay for. For someone starting out, however, it is more important to have something now, rather than wait for the best gear possible. You can always upgrade when you get more monetary appreciation for your talents. I've used the Yongnuo transceivers for over a year now and have been pleasantly surprised at their breadth of functionality and reliability. Couple that with an unbeatable price and you have an amazing value. For the following images, I used my LunaGrip with a Nikon speedlight triggered with the Yongnuo system. In this image, I under-exposed my ambient light by 1 f-stop to keep the mood dramatic and so that the existing light would actually form the fill light on my subject. Because I wanted the light source closer to my subject than the composition would allow, I used 2 shots. The first was captured with the light source in the scene, where it needed to be, and the second was with the light source removed. I then used a simple layering technique in Photoshop to paint away the light modifier. i used My 2-shot disappearing light trick to combine 2 images: one with the light source where it needed to be and another with a clean background. The Lunagrip provided the soft, beautiful light. I used an ND Filter to reduce my shutter speed to 1/250 so I could get maximum output from my flash that was diffused through the lunagrip. This is a slick camera backpack! You'll be hard pressed to find a better fit or function. I am currently traveling in Italy, and constantly reminded how much I like my MindShift camera backpack. They just seem to be so well thought out and are built to such incredible quality standards. 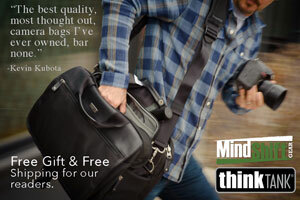 Then, I get this secret message: MindShift have a new pack and they will actually let you try it FREE for 30 days! No risk, you don't even have to pay for it up front. Wow. Try out their FirstLight outdoor photography backpacks on a 30-day, risk-free “test drive.” Call them toll free at 866-558-4465 x1, 8:30 AM - 5 PM PST Mon - Fri and they'll process your free test drive trial. Ask for FedEx Ground shipping and they'll include it at no charge. And, be sure to mention my name when ordering to get the free trial deal. The FirstLight backpacks are designed for the traveling outdoor photographer. The two packs are carry on compatible on virtually any regional and large commercial flight, making getting to your destination with your gear a worry free experience. The FirstLights' contoured, 11-point adjustable torso harness fits most men and women. A shaped aluminum torso stay provides additional support. The packs also utilize ballistic nylon bottoms for long lasting durability. They have dedicated water bottle pockets on both sizes, while the 30L also accommodates up to a 3L hydration reservoir. Both have long lens capacity, big stuff pockets, sternum strap whistles, with extra room for your 15" laptop and personal gear. Use the accessory straps to carry a tripod, monopod or hiking poles. They've also included a seam-sealed rain cover. When attached, rain cover allows small to medium tripods to be carried on front or side positions. The FirstLight 30L is sized for gripped DSLRs and larger gear and will hold up to a 500mm f/4 lens detached or 400 f/2.8 attached. The FirstLight 20L is sized for standard size DSLRs and robust mirrorless kits and will hold up to a 200–400mm f/4 attached or 300 f/2.8.